Wooden box containing 25 plates: 1 sliding plate in transparent plexiglas, silkscreened in red, as a lid; 1 paper cover printed in black with, on the front outside, the title, and, inside, text in German by Filliou, 1 plate with the same text, translated into english, 24 plates silkscreened in black. Inside the back cover, numbering and signature by Filliou in red ink. Offset black and white photos of the hand palms of: Red Grooms, R. Watts, R. Lichtenstein, B. Patterson, Marisol, A. Warhol, J. Cage, J. Johns, R. Breer, Ay-O, M. Brusse, S. Hyde, P. Bury, Arman, A. Knowles, Takis, Christo, R. Filliou, E. Williams, A. Jaquet, R. Johnson, D. Higgins, J. Mc Low, C. Oldenbourg. Photos by S. Hyde. SABA-Studio, Villingen, Sweden, 1967. 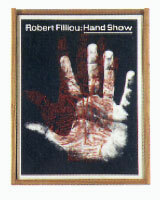 \"Robert Filliou, Das immerwÃ¤hrende Ereignis zeigt-The Eternal Network Presents-La FÃªte Permanente prÃ©sente\", Sprengel Mus., Hannover-MAMVP, Paris- Kunsthalle Bern, 1984, p. 83-84; \"Robert Filliou Poet\", Sammlung Feelisch, 1997, p. 21, nÂ° 7. S. Jouval: R. Filliou: Catalogue raisonne des editions & multiples, livres et videos, Les Presses du reel, 2003, nÂ° 17, p. 34-35.